Our GOTS Certified Organic Cotton Calico is a medium weight fabric suitable for use all year round. The perfect choice for extremely chemically sensitive people. 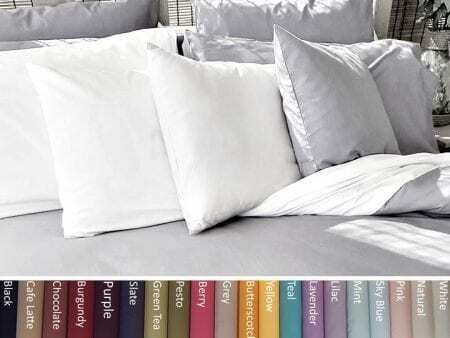 Made to Order – Calico Organic Cotton Flat Sheets without cuff. Made in an Organature Sewing Room, with 100% GOTS Certified Organic Cotton ‘loom state’, non-washed or treated Calico. Our Calico is in ‘Loom State’ – not washed or treated with any chemicals. It is quite stiff and wrinkled fabric before being washed, however it has no chemicals used throughout the manufacturing stages, therefore it is ideal for people who are very chemical sensitive and for those who want a 100% Natural fabric. (Please note: it does contain some natural cotton oil and natural starch to assist in the weaving process, which is permitted under GOTS and is essential to weave the fabric). Useful Information About Calico: Sometimes people think that if they buy calico somewhere, it is always pure calico and means it has no treatments. They are wrong. Most, if not all, calico sold in shops and by fabric wholesalers are treated with formaldehyde. Naturally our 100% Organic Cotton Calico produced to GOTS certification standards is not treated in any way. The only additive in Organic Calico is the Organic Corn Starch which is needed to stiffen the yarn to be able to weave the fabric. It is the best stiffener available, so good, in fact you can eat it. Care Instructions: After a several washes the fabric will soften and reduce in wrinkles. We recommended the first wash at between 40-50 degrees to assist in this softening and an initial shrinking process. Do Not use commercial softening products – Vinegar and Soda Crystals are a good natural substitute to assist in this process instead. Sizes Available: Single, King Single, Single Long, Double, Queen, King, Super King, Cot, Bassinet and Cradle. Colours: Available in Natural Only. Please note: Approximately 10 – 15% Shrinkage will occur with all ‘loom state’ Calico Products. However we cannot guarantee the shrinkage amount exactly. It is due to this, that we do not offer Fitted Sheets, however our flat sheets are made large enough to tuck under the mattress. Our calico pillowcases and quilt covers are cut slightly larger to allow for shrinkage. Our pillowcases and flat sheets do not have cuffs. Orders can take up to 2 weeks to be completed.